Midiskibis (Sami Pekkarinen) is an electronic music project from the rabid human-baboon, Skibis from Papua. His first musical experiments were drumming the human skull at the age of three. Today he lives in southern Finland and has a background in the underground psytrance world with projects like Re-Animator and Pekkanikkarinen. 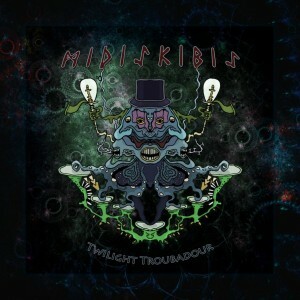 Twilight Troubadour, a mini album released by Freudian Slip Records, is mostly inspired by the classic horror stories and crappy B-movies. A few of the songs are made for the soundtrack of certain short movie made in 2010. Produced with Astroschnautzer (Wille Hermansson) at Freudian Slip Studios, 2010. Mastered by Astroschnautzer with cover art by Frank Kukat and Midiskibis. MP3 Download | FLAC Download | WAV Download · Download count: 14,616. Released under a Creative Commons licence for noncommercial usage. Be sure to check out Pekkanikkarinen if you enjoy the sound of this release! Deliciously weird, exactly what my twisted neural pathways want to hear. With a midtempo propulsive groove, I can see this working for both relaxing and dancing. Wow. Some of the most consistently attention-grabbing psytrance I’ve heard; it really does seem to demand more of the listener. Definitely not my everyday choice, but also definitely a keeper for when it’s needed. Good Music. My first comment after years of downloading here. I want to say THANK YOU to BASILIK from deep down my heart! Your website is amazing. Labalabalong, great sound, great album, great digital horror stories! meh like! Big respect for this realy great releas, simple amazing! Hellou, and big thanks to you all for downloading and diggin this album, it means so much for me. I have the heat for the sequel so tsiggidii you after a little while :) from the heart, where it may go! Truley beautiful. Love the mellow forward darkness of this work – feels like deep space and its mysteries. Has so much breathing room for the imagination, yet such delicate timbres and pleasant progressions of energy. I will be listening 2 this often. Very deep and thoughtful. Excellent psychedelic feelings here. Thanks Midiskibis! Freudian slip records has a new release, check previews @ http://soundcloud.com/freudiansliprecords/sets .